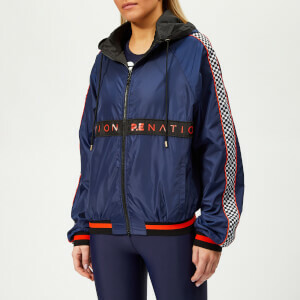 Black bomber jacket from Australian activewear label, P.E Nation. 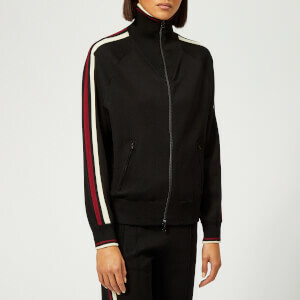 Created using a lightweight technical fabric, the ‘Centre’ sports jacket features a wraparound neck, an exposed zip fastening and striped ribbed trims at the collar, cuffs and hem. Thumbholes and pockets at the sleeve and side seams improve functionality, while a colour block panel across the shoulders adds style. Embroidered logo detail completes the design. Main: 50% Cotton, 50% Nylon. Lining: 100% Polyester.